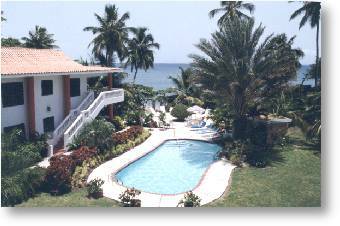 This beautiful beach house has four large 2 bedroom apartments on the best snorkeling beach in Rincon Puerto Rico. The home includes a large oceanfront pool for the exclusive use of the guests. This is a casual and comfortable oceanfront home. Enjoy the soothing sounds of the surf and view spectacular caribbean sunsets in the comfort of your private balcony or patio. Reserve all four units for that large get together or wedding! Enjoy the large and well manicured yard and enjoy the beautiful new pool and gazebo with barbeque grill. Each unit at this beach house is a 2 bedroom 2 bath apartment with fully equipped kitchen, Rattan Style furnishings, Air Conditioning, Cable TV, private telephone, offstreet parking, covered ocean facing balcony or patio, picnic area, located in a quiet beachfront neighborhood in Rincon. These beachfront vacation rental apartments are located near the beautiful 'Steps Beach' in Rincon, Puerto Rico. 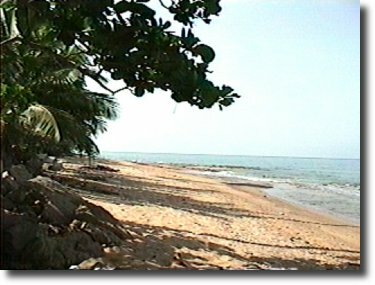 This is a beautiful sandy beach offering the best snorkeling experience in Rincon. Snorkeling, whale watching (in the winter), and other water activities are available. Or just sit back and relax in you own private covered porch, private patio, splash in the pool, take on a tan in the sun deck; or just enjoy the surf and the beautiful caribbean sunsets each day.